The purpose of vaccinating patients with cancer is to achieve objective tumor regression or stasis, in contrast to vaccination strategy in infectious diseases, where it is primarily preventive in nature. Anti-cancer vaccines are designed to maximally induce and sustain host immune responses targeted against tumor antigens, leading to subsequent cancer cell death. Most cancer immunotherapy trials have been performed in patients with advanced cancers, in whom established therapies are usually ineffective or the patient has run out of therapeutic options. Such a therapeutic immunity is clearly more challenging to generate and sustain, compared with preventive immunity, as active immune surveillance and constant targeting of the tumor is required. 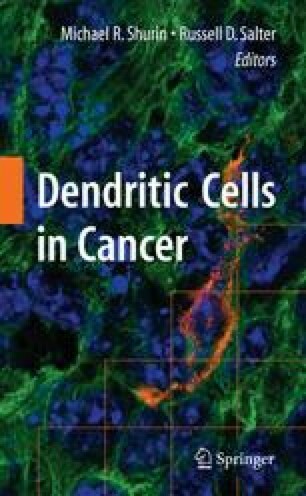 As dendritic cells are the most potent antigen-presenting cells that sensitize naive T cells to antigen, designing cancer vaccines using the patient’s own autologous dendritic cells is a logical and core concept in cancer immunotherapy, which continues to be an area of major interest and therapeutic challenge for both clinicians and scientists. MMA is a recipient of a research grant from the Royal College of Surgeons of Edinburgh. We gratefully acknowledge financial support from the following: Candles (Lincolnshire), Friends of Lincoln hospital, Boston Leukaemia Research Fund, and Rosetrees Trust.